It has only been a few weeks since an FBI investigation uncovered the largest ever college admissions scheme. The scheme was orchestrated by William Singer, owner of college admissions companies Key Worldwide Foundation and Edge College & Career Network. Singer pled guilty to accepting bribes totaling $25 million, and he has claimed to have worked with over 750 families. Singer bribed, lied, and cheated so that his “students” could get into the best colleges. So many students work incredibly hard––too hard, in fact––to get into university. They pay ungodly amounts of money to Kaplan and other test prep giants so that they can game the SAT, they high private admissions counselors, and when it’s all said and done they take out an average of $30,000 loans per student. Of course, the poorest students often take out the most, and they hope to reap huge rewards. The looming student loan crisis began to make many question the worth of a college degree, at least insofar as it was weighed against crushing debt. But for many students, the Singer scam has broken their spirits. The admissions process is so obviously biased and broken, they think, that it’s not worth bothering about. 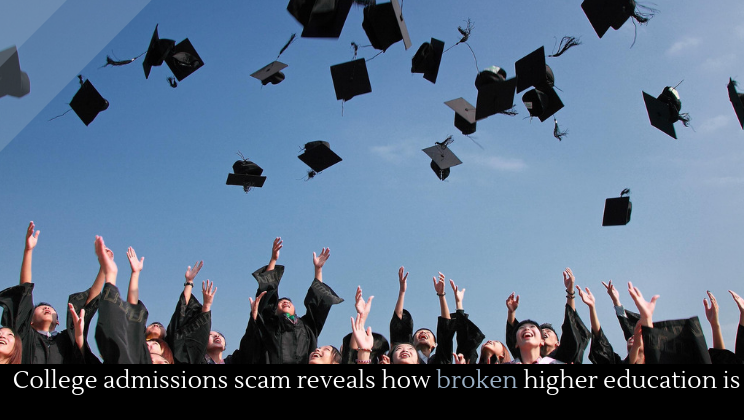 College admissions scams are very popular. Thanks for sharing this great article. Please continue to share such useful information. BROKE! IT WORKS JUST THE WAY THE WEALTHY WANT IT TO WORK! ACCEPTED AT BOTH USC AND UCLA WITH FULL 4 YEAR ACADEMIC SCHOLARSHIP, CHOSE THE BEST ACADEMIC SCHOOL (UCLA)… AND TURNS OUT REALLY, REALLY HARD COMPARED TO GF WHO CHOSE USC… ADMITTED IT WAS AN ACADEMIC JOKE BUT SHE WAS REALLY LOOKING FOR A RICHIE-RICH ;-). I HAD TO EARN MY EARLY RETIREMENT/FORTUNE!